Soups make great 30 minute meals. There is nothing quite like a big bowl of creamy soup on a cold winter’s night. 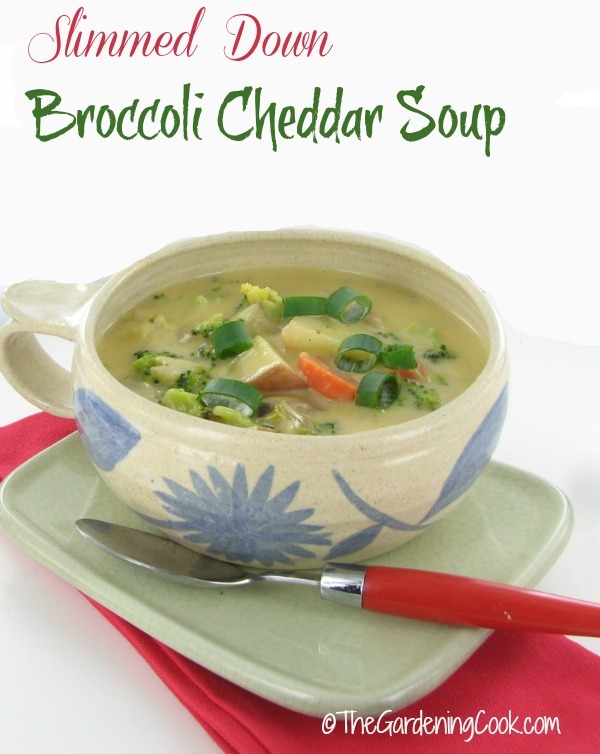 This slimmed down broccoli cheddar soup is rich and delicious but without the calories of a full cream soup. Yet the flavor will make you think that you didn’t skimp on the cream. Enjoy a Crisp winter day with a big bowl of Broccoli Cheddar Soup. Broccoli is one of the favorite veggies in our house. I love using it in broccoli salads, main courses and soups. For today’s recipe, I am dong a slimmed down version of the traditional Broccoli cheddar soup. The key to the taste of the soup is using fat free evaporated milk. I use it all the time in recipes that call for cream with great results. For another great slimmed down recipe, check out my baked chicken cordon bleu. The flavor is amazing. This simple soup has really very basic ingredients, but it tastes good enough to serve for any special occasion. 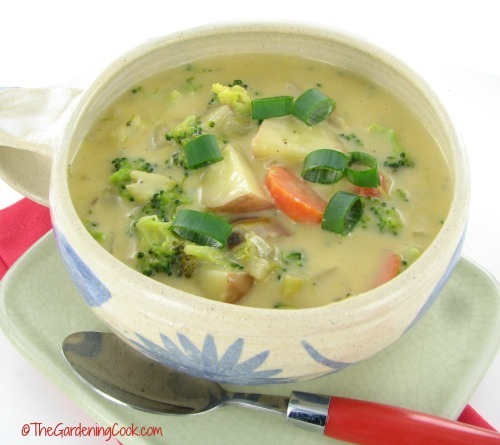 The green broccoli florets and the brilliant orange carrots give this creamy soup a splash of color that appeals to the eyes as well as the stomach. Serve it will some of my crusty Italian bread for a hearty and delicious winter meal. Cut the broccoli into florets and peel and slice the carrots. Finely chop the stems of the broccoli and set aside. Heat the olive oil in a non stick pan over medium heat. Add the broccoli stems, onions, carrots and potatoes and Stir in the flour and cook, stirring, until lightly toasted, about 2 minutes. Add the broth and bring to a boil. Reduce the heat to maintain a simmer and continue to cook, stirring occasionally, until thickened and the vegetables are tender, about 12 to 15 minutes. Meanwhile, cook the broccoli florets in the microwave until tender, about 2 minutes. Add the florets to the soup along with the nutmeg. Stir to combine and remove from the heat. Stir in the Cheddar, Worcestershire and evaporated fat free milk. Season with salt and pepper. Garnish with the scallions.